HTC has been working on its upcoming flagship- the U12+ and it will be high on specs. According to a new leak that is doing the rounds of the internet, HCT U12+ will come with features like a bezel-less display without a notch, dual front cameras, Snapdragon 845 processor with up to 8GB of RAM, and wireless charging. Although there is no official announcement about the launch of U12+ and HTC is said to unveil it sometime in April. In another news, case renders of the alleged HTC U12+ have also leaked online suggesting the phone will come with HTC’s liquid surface design, and with a bezel-less 18.5:9 aspect ratio display without a notch. Earlier, Evan Blass has also leaked an image of alleged U12+. The HTC U12+ will supposedly come with a 5.5-inch Quad-HD+ display with Corning Gorilla Glass 5 on top. Notably, it will be a full-screen display without the lately trending notch. The dual-SIM phone will likely run Android Oreo-based Sense UI. 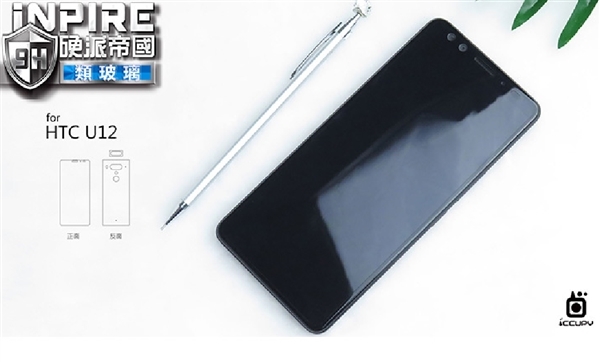 The phone is said to be IP68-certified for dust and water resistance. The phone is said to be powered by a Qualcomm Snapdragon 845 processor with up to 8GB of RAM and 128GB of storage which would be expandable up to 2TB via a micro-SD card slot. 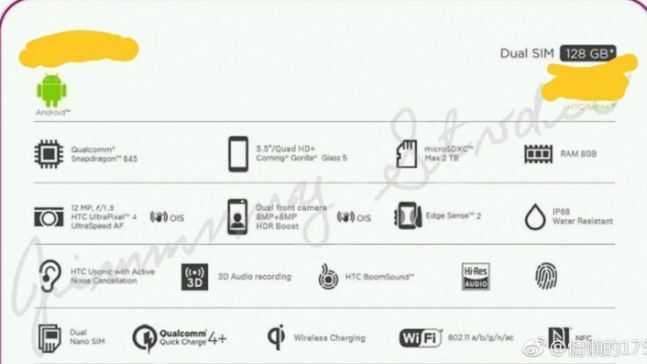 It will also come with Edge Sense 2.0 that might bring some enhancements to HTC’s squeeze feature. On the camera front, the U12+ is likely to come with a 12MP primary sensor with f/1.5 aperture, UltraPixel 4 technology, and Ultra Speed AF, along with OIS. Earlier rumors suggested that the U12+ rear camera would also be a dual camera setup with a secondary 16MP sensor. On the front, the U12+ is said to come with a dual selfies camera with 8-megapixel sensors with OIS. On the audio front, the U12+ will support HTC’s U-Sonic sound technology and BoomSound along with High-Res support as well. The battery capacity is not known yet, but the U12+ will support Qualcomm Quick Charge 4.0 and Qi wireless charging.